April 2019 – Family friendly Cologne International Cricket Club e.V. Family friendly Cologne International Cricket Club e.V. A successful but nerve-wracking run-chase gave CICC back-to-back wins on Saturday (13th April) despite the chilly weather. The home side secured a two-wicket win against Deutsch Welle CC in their second Regionalliga 50-over match. CICC won the toss and without a second of hesitation decided to bowl first given the combination of 3-degrees temperature, a damp pitch and slow outfield (as usual). Ritvik and Mansoor, leading the attack with their pace and swing bowling, got CICC off to the best possible start to the match by clean bowling the opening batsmen in the Deutsche Welle line-up. Both finished their first spell with a wicket each, leaving the visitors unsettled in their quest to set a target. Unfortunately Ricky got injured while trying for a caught-and-bowled opportunity, which forced skipper to try various spin options later on. Meanwhile our young lad Furqan stepped up to capitalise on the situation and went on to achieve his end 5-wicket haul in two games. Kamran again took 3 wickets with his pace. Furqan went on to complete his 10 over spell and finish the visitor’s innings with a swingy LBW. Again sharp fielding and well-held catches helped CICC to restrict the opposition to 110 all out. After the break, Wahab and Kris opened the innings for CICC and this time racked up a 50-run partnership, both showing good discipline and consistency. A low yorker sent Wahab back, and Nag fell next ball to an LBW. Tushar started to build the innings with Kris but didn’t last, a yorker costing his wicket. Kris on the other hand managed to hang on, having to watch Kausar and Ricky returned without scoring. Koushik joined Kris to build the innings, but he was bowled by an amazing full length ball leaving CICC under pressure. Two-minded shot selection then sent Koushik back to pavilion. Fortunately Afaq and Furqan once again saved the day with a brilliant rearguard partnership, securing the second win for CICC. After a bad call cost Furqan’s wicket with a runout, Afaq and Mansoor finished the chase for CICC. Again, a collective team work, good showcase of skills and team spirit lead to the second win for the Hosts. Furqan was the outstanding bowler again for the hosts with 5 wickets from his ten overs, while Kamran picked up 3 wickets off seven overs. Kris was the pick of the batsmen with a consistent 30 runs for the hosts. Still the top order batting unit once again fell short of expectations and will have to improve in future, higher-scoring games! Man of the match award was shared between Furqan and Kris for their collective approach towards game with both ball and bat. Again, great team spirit was helped by the support of Ahsen, Jani. 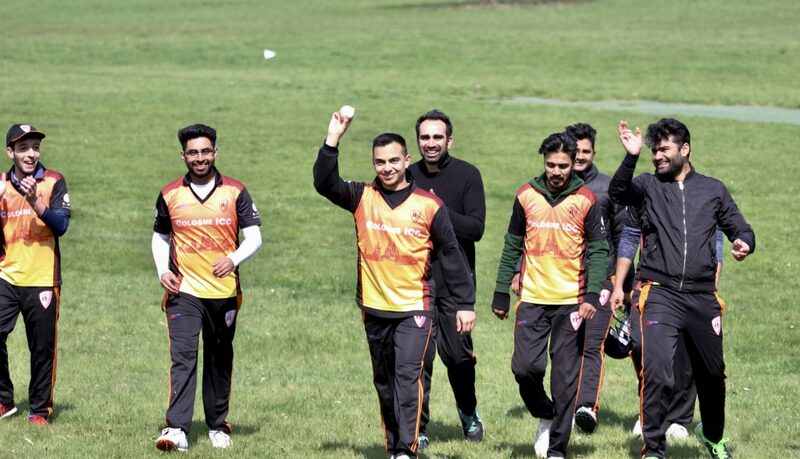 CICC returned to winning ways on Sunday (7th April) when they secured a three wicket win against the Aachen Leoparden in their first Regionalliga (RL) 50 over match. Following the disappointment of defeat to the same side in a high scoring match in the previous year’s last RL match, the visitors (CICC) from the Cologne were determined to secure a result this time. Visiting skipper Koushik won the toss and elected to field first. Opening bowlers Ricky and Mansoor Khan put tremendous pressure on the opposition openers with their accurate swing and pace by not allowing the batsmen to score the runs in their first spell. 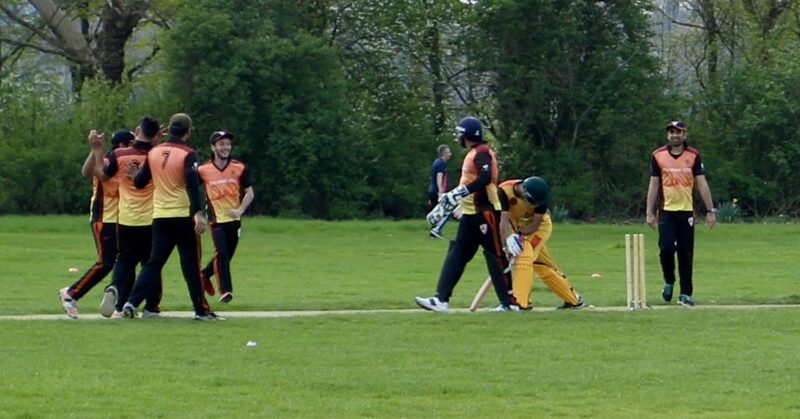 This early pressure was then capitalized on by Furqan, who after a first breakthrough went on to get a 6-wicket haul. Kamran again gave the opposition problems with his pacey bullet balls and took 3 wickets. Afaq, on debut also did good job with his left-arm spin, taking the final wicket – his first for CICC! With the help of sharp fielding and no dropped catches, the Leoparden were restricted to 105 all out. Wahab and Kris (on debut) opened the innings for CICC. Unfortunately both returned very early adding just 10 to the total. Nag and Tushar tried to steady the ship, but Tushar was caught for 2 off Gulistan followed quickly by Kausar. Despite the tumbling wickets, Nag continued to accumulate runs with his discipline and experience. Ricky joined Nag and steadied the innings with a crucial partnership. But two debatable LBW decisions cost both Ricky and Koushik their wickets (time for DRS !? ). Nag was sent back shortly afterwards by a brilliant catch, leaving CICC in a perilous position. But the blushes of opposition were spared by Furqan and Afaq who safely negotiated the remaining runs required to take CICC to 107 for 7. Overall, a collective team work, good show case of skills and team spirit lead to the first win for the visitors. Furqan was Man of the Match with 6 for 35 from his nine overs. The support by Ahsen, Ali and Umar was excellent, and this helped keep up a great team spirit! CICC will be hoping to continue their winning ways next Saturday when they face Deutsche Welle. © 2019 Family friendly Cologne International Cricket Club e.V.